After attending the ever interesting and informative Cosmopolitan Fun Fearless Female, a jewelry and accessories forecast presented by Brooke Rosen Lucks - Associate Accessories Editor of Cosmopolitan, we have the inside secrets to keep you in the loop on upcoming jewelry trends. Follow these five trends as they pop up in your in-scoop trend magazines, on the streets of the big city, on the big and little screen celebrities you love to watch, and hopefully on you! 1) Lions, tigers, and bears. Oh My! Animal inspired jewelry is making a roar in the upcoming season. 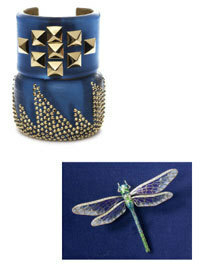 Besides the animals that have appeared in this trend before, try something unique with a pink diamond encrusted octopus by Christian Tse, the light and airy enamel and diamond dragon fly by Rand, or the silver and diamond insect by RedStart. 2) Futuristic and architectural designed clothing are filling the pages of our favorite fashion magazines. Compliment this new look with art-deco designed jewelry like the mixed metal and diamond bands from Fana, or eye catching cuffs from Kara Ross. 3) Follow the rule of the four B’s this season: Big, bright, bold, and beautiful. Make a statement with your jewelry choice like stand out rings from Daniela Swaebe or chunky bracelets from Alexis Bittar. 4) Big chunky watches double as a time teller and a bracelet. To perfect the time telling accessory look this season give your wrist a work out with big oversized rose gold watch. 5) Express your inner-self with your outer-wear. Adorn yourself in jewelry that makes a personal statement, and that can stand alone to go with that less couture dress you may have picked up while browsing through H&M or Forever 21. Alex Woo and Carolina Bucci both offer pieces that may show the sweet yet always fashion conscious inner you.